Leather fabrics shouldn’t be cleaned with ordinary detergents and need specially chosen and appropriate products to be sanitised effectively. Our company offers some of the most professional and inexpensive leather sofa cleaning services in Wandsworth SW18 which save time and money. Instead of inflicting tearing, peeling and damages on your suede, pigmented, aniline or other type of leather sofa, rely on our qualified staff to sanitise it. They have the skills and supplies to make your sofa impeccable and spotless in matter of hours. Get in touch with us for more information and book the inspection of your sofa. 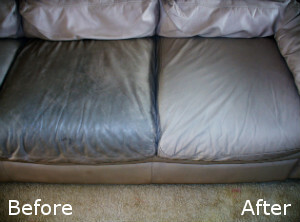 Leather sofas require professional cleaning every time they become darker, stained and lose their sealants. If proper cleaning isn’t implemented, the sofas can get cracked, peeling and damaged. Our technicians inspect the fabric of every sofa and choose the most suitable preparations and methods for removing the dirt from it. They apply foam detergent or liquid solution on the leather and let it stay for some time. The grime, stains and soiling is removed with a clean microfibre cloth. 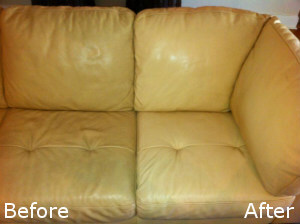 Our staff apply moisturising agent onto most leather sofas and all natural leather ones. This protects them from further soiling, staining and getting cracked. If you need professional sanitising of your leather furniture use the leather sofa cleaning which we offer in SW18 every day in the week. The best way to restore heavily soiled, darkened and stained leather items is to have them sanitised by qualified cleaners. You can count on our employees to implement the leather sofa cleaning that we carry out in and near Wandsworth at reasonable prices and a suitable for the customer time. You will receive professional results.